Capturing the beauty and essence of a landscape is very exciting and rewarding. So why consider creating a landscape painting ? As months,days and hours pass by wherever we live the landscape around us is changing. Different seasons, different temperatures, different times of day our landscapes are evolving. Their mood changes. It may be your backyard landscape or your favourite holiday destination but we all can close our eyes and imagine a landscape we love. A landscape that speaks to us. You may be new to painting or more experienced. I encourage you to come on a journey of discovery. Together lets explore the fascinating and addictive world of landscape painting! Sketch and Draw . . . Learn about sketching and how it is the foundation for quality drawings and paintings. Consider drawings as an artform in its own right. Discover top tips on composition. Painting a Landscape . . . Why paint a landscape? Lots of ideas about painting on location, the impressionist landscape, painting landscapes and being a landscape artist. Colour . . . Why we use it, and how to use it . . . Consider colour theory, color wheels, color mixing and being a colorist. Acrylic Landscape Painting . . . Discover the benefits and skills involved in using acrylic paints. Learn about acrylic landscape painting techniques, how to incorporate flowers into the landscape, and meet other acrylic landscape artists. Mixed Media Painting . . . Find out about this contemporary style of painting. Understand the different media used. Learn new techniques and be challenged to explore monthly projects. Themes in Landscape Painting . . . Explore the many themes covered, including seasonal landscapes, beach and coastal landscapes, the English landscape and more specific areas such as trees in landscape painting. Materials . . . Masses of information about different paints, brushes, papers, the list goes on and on. Learn about new art supplies being brought onto the market. Share your ideas and opinions. Image gallery . . . Browse through this valuable resource, where you can learn about landscape images and source material. Look through the library of landscape photographs and download helpful images. 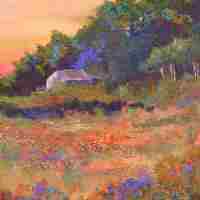 Gallery of landscape paintings . . . Enjoy the paintings in this vibrant and interesting gallery. Step by step painting instructions . . . Follow step by step tutorials. Art Classes . . . Art classes explained and discussed. Landscape Painting Tution How online tution and lessons can be really helpful. Mixed Media Workshops . 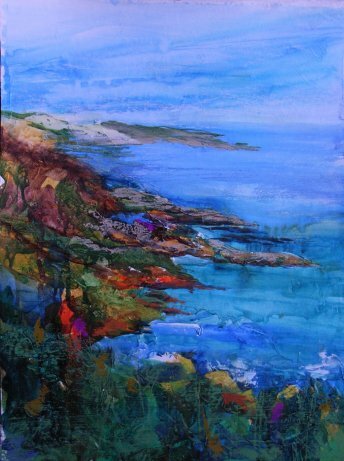 . . Workshops exploring mixed media painting run by Marion Deacon. Would you like to host your own website? Solo Build It could help you realise your potential. Sketch and Draw ...the what, when and how . Colour ... some of the mysteries explained. Painting a landscape....How to choose what to paint. Acrylics - how they are flexible and versatile. Acrylic Landscape ... All about acrylics and how they can be used to capture the magic of a landscape. 'How to Paint' ... painting rules explained to help you improve. Top tips on deciding is it finished when completing a painting. Landscape painting tuition is all about wanting to learn and improve your painting techniques. Art materials - Explanations of what they are, how they work, where to buy them and how to look after them. Discover all about handmade, modern greetings cards based on landscape paintings. Learning about SBI will help you create a website that works!! !